By J. Randolph Turpin, D.Min. Behold the Son has been prepared as a resource for personal study and as a tool for teachers walking their students through a study of the Gospel of John. These pages contain the complete text of the Gospel According to John. The commentary in the footnotes features technical notes, cross references, sermon notes and the author's personal reflections. To further assist in the study, tables have been inserted providing a harmony of the Gospels in those places where such information might prove relevant and helpful. 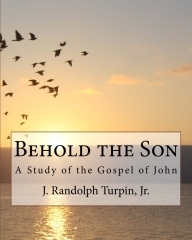 Dr. Turpin declares this blessing over all who work through this study: "May you behold the Son of God with every turn of the page, with every word that you ponder, and with every prayer that you pray in response to the message of this amazing Gospel." Declaration Press - www.DeclarationPress.com. Awesome Inc. theme. Powered by Blogger.